Giants forward Jack Flaman fights for the puck with a Silvertips player during WHL action on Friday. It may have been ugly sweater night at the Langley Events Centre, but both the Vancouver Giants and Everett Silvertips offence was beautiful at times. The Giants had the lead on four different occasions, but couldn’t hold it, ultimately losing 5-4 in the shootout to the Silvertips. 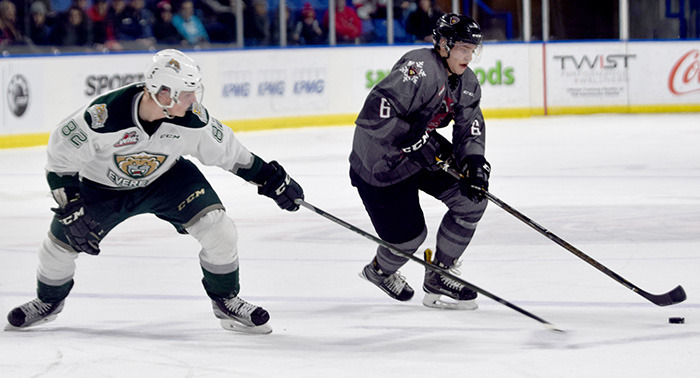 The shot clock was tipped heavily in the favour of Everett, with the Silvertips outshooting the Giants 53-21. Vancouver head coach Jason McKee said it was a good effort, but his team needs to stop making crucial mistakes. Thomas Foster opened the scoring for the Giants at 8:25 of the first period, and the goal stood until 3:14 of the second period when Sean Richards got Everett on the board. A flurry of goals happened right after, with Radovan Bondra putting the Giants back up, and Eetu Tuulola tying it back up. All three goals were scored in the span of 33 seconds. Jack Flaman tallied at 14:45 of the second period to put Vancouver up 3-2 after two. Abbotsford’s Noah Juulsen tied the game back up at 2:52 of the first, but Giants captain Tyler Benson gave the Giants another lead after a nice tip in front of the net at 9:05. The lead was again short lived as Everett tied it up 52 seconds later when Dominic Zwerger scored. Nothing was settled in overtime, and the Giants trio of Benson, Foster and Bondra failed to score in the shootout. Tuulola was the lone goal scorer in the shootout and that was enough for the win. McKee said his team’s offence was encouraging, especially against one of the top teams in the WHL in Everett. He pointed to mental mistakes that cost his team. Despite the shootout loss, he said the team has made big strides since a 7-3 loss on opening day back in September to these very same Silvertips. The Giants next take on Spokane tomorrow (Saturday) night at 7 p.m., with the club once again donning the ugly sweaters.